Scott and I have had an empty nest for over a year now and it has impacted us in several ways. First and most obvious, the house is quieter. Some might say peaceful, others would get creeped out by the sheer lack of volume. Second, our environs are cleaner (usually). No shoes and backpacks lying around. No dirty socks dribbling down the hall or piles of laundry laying in wait for my next load of whites. Third, and most distressful for Scott, is that there’s no one else to blame for eating the last of the cookies, chips (insert addictive snack here). If it wasn’t me — it had to be him. I think that’s why he’s talked about getting a dog. 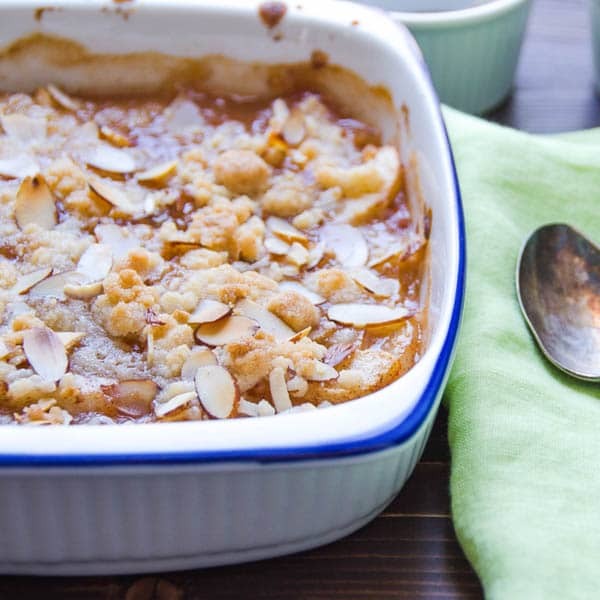 Case in point: this ginger pear and almond crumble. I think I had two servings. (it makes 6). Now I’m not pointing fingers, but if it wasn’t him, I think we should set out some big rat traps. I adapted this recipe from Maida Heatter’s recipe in her book Pies and Tarts. The ginger gives what would be a ho-hum fruit dessert a warm, tingly kick. 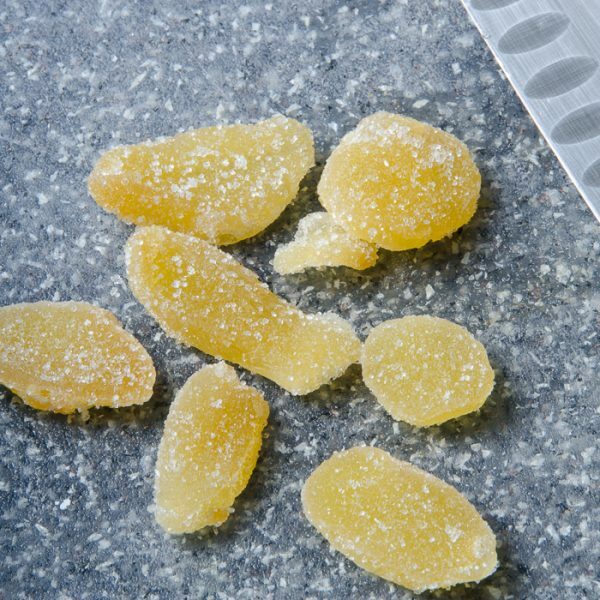 Crystallized ginger is the key. It has an intense ginger flavor that turns up the volume of the pears. 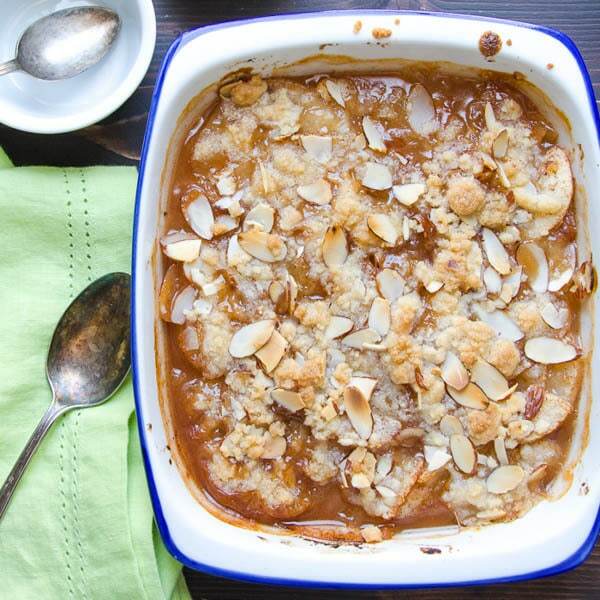 And the crumble is sublime – with sugar, butter, a little ground ginger and sliced almonds. 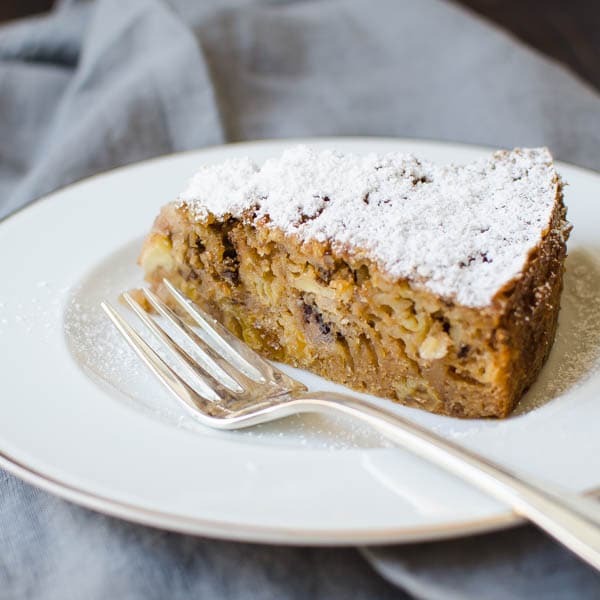 You’ll want a bit of this streusel-ly goodness with every bite of the fruit. 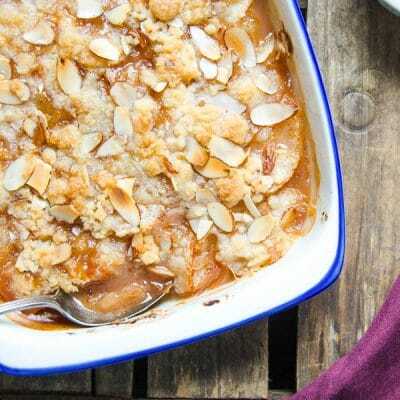 Serve this crumble hot from the oven, preferably with a scoop of vanilla. Em – sorry, but you’re missing out! Looking for more fall fruit inspiration? 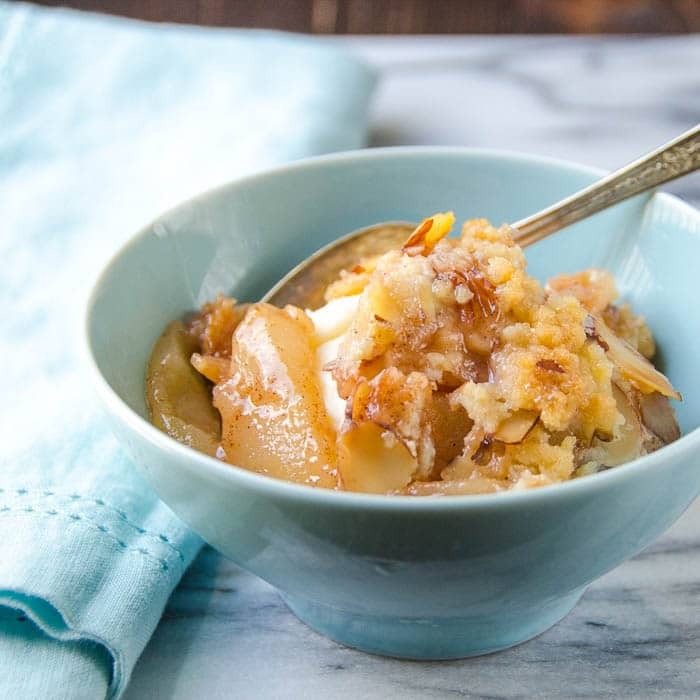 Try this warm apple crisp with a cheddar crumble topping. Crystallized ginger and ripe pears make an incredibly zingy combination. Preheat the oven to 375 degrees. Spray an 8x8 baking dish with vegetable spray and set aside. 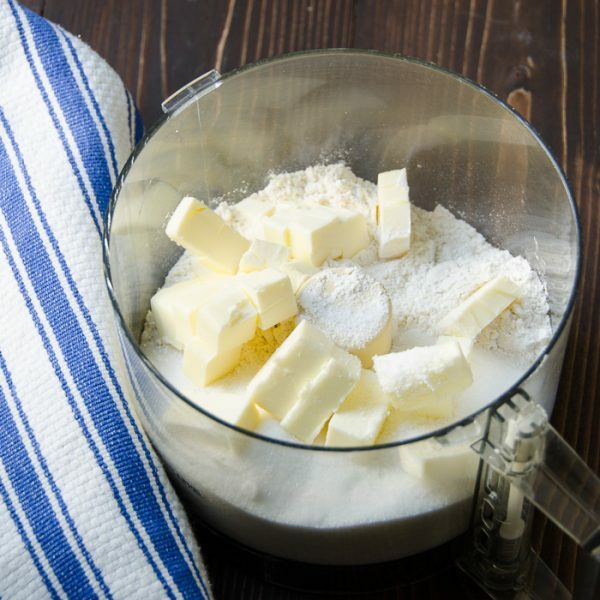 Place the flour, sugar, ginger and butter into the bowl of a food processor and pulse until mixture resembles coarse meal. Transfer to a bowl and with your fingers, work the mixture, squeezing to create a lumpy, crumbly texture. 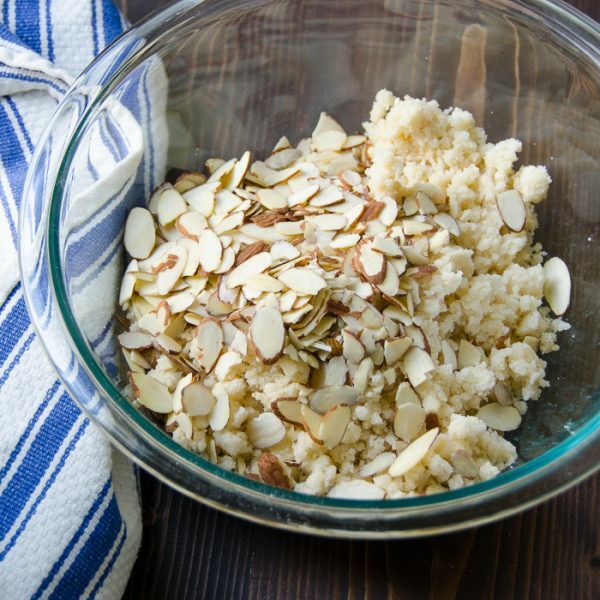 Add the almonds and toss to combine. Refrigerate until ready to top the crumble. Peel the pears and halve them with a sharp knife. Cut the halves in half again and remove the core and stem. 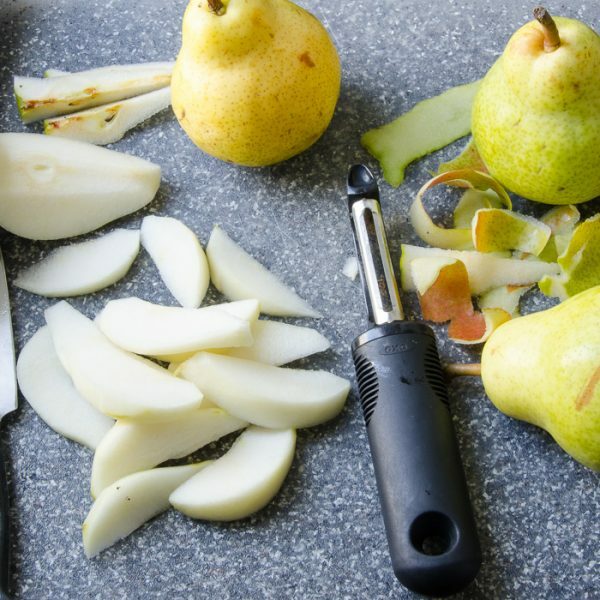 Cut pears into thin slices lengthwise. 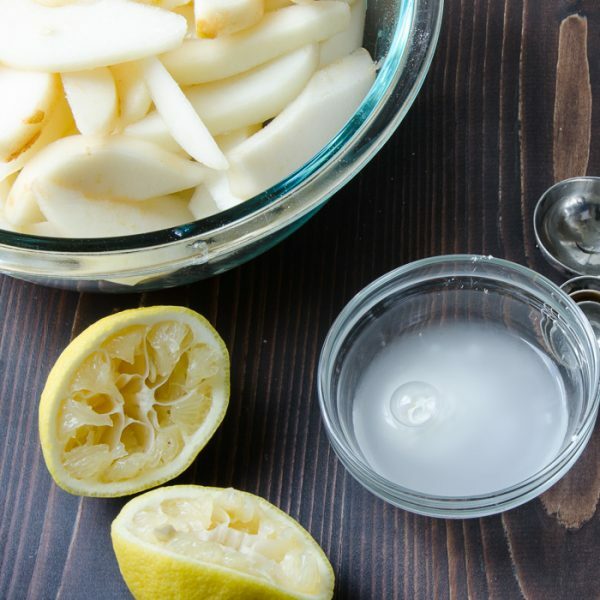 Transfer pears to a large bowl and sprinkle with the lemon juice. Add the minced ginger and toss together. 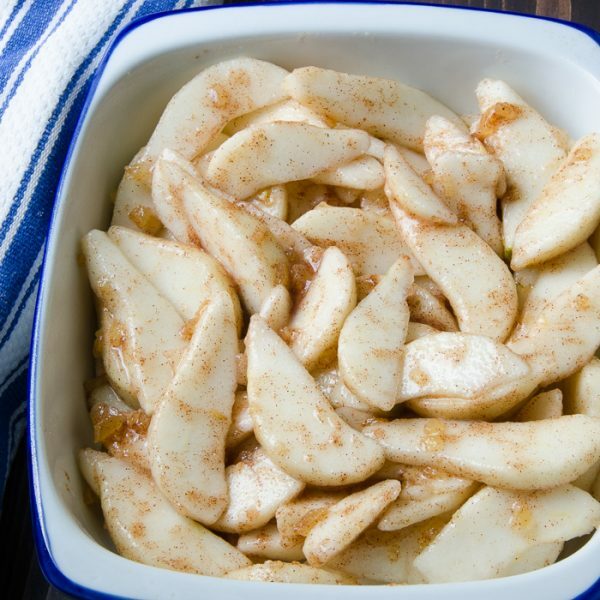 Sprinkle the pears with cinnamon and nutmeg. In a small bowl, mix the water and cornstarch together to form a slurry. Pour over the pears and toss to coat the pears with the slurry and spices. Transfer the pears to the prepared baking dish. Liberally sprinkle the almond topping over the pear filling. Bake for 50 minutes to 1 hour until the fruit is tender, but not mushy and the topping is a warm, golden color. If the fruit is tender, but the topping is pale, place it under the broiler for 4-5 minutes to get a little color. Serve warm with a scoop of vanilla or a drizzle of cream. 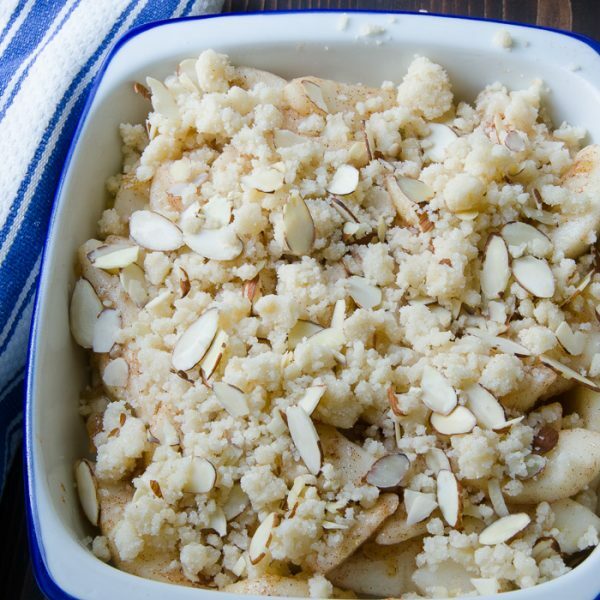 Pin “Ginger Pear Almond Crumble” For Later! This flavor combo is one of my favorites. It looks divine too! Yummm! 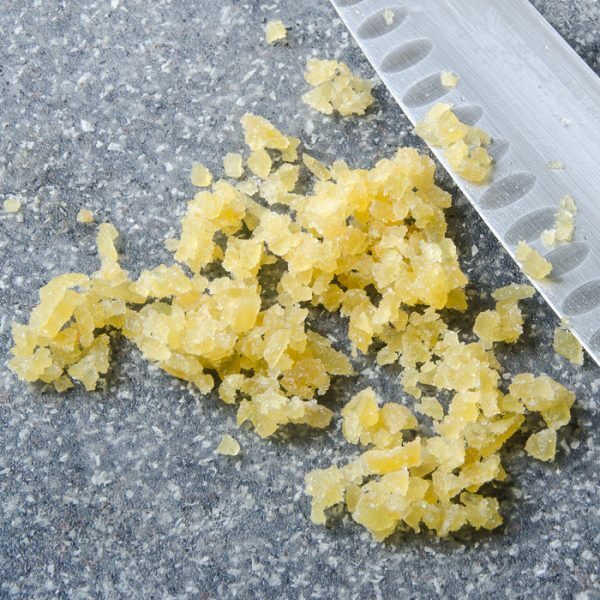 I love the idea of adding candied ginger–I will have to try this the next time I make a crisp or a crumble! Ginger pear is one of my favorite combinations! Love the almond crumble! Oh this may sound silly – but I have never thought to combine ginger with pear. Why!? 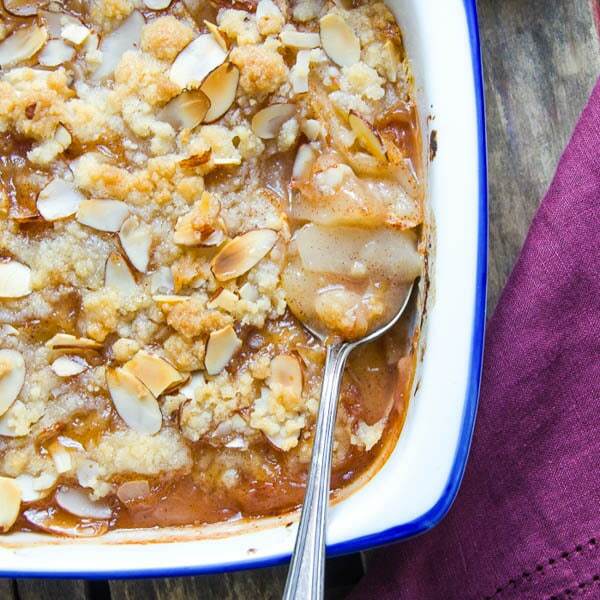 It sounds perfect and this crumble looks divine! It’s not in the mainstream, but it works! This sounds so delicious! The combination of pear and ginger has to be one of the best there is. I’ll try the recipe as soon as I can. Definitely! Don’t let pear season pass without giving it a go!